Is there anything better than wrapping your hands around a warm mug of something delicious after coming in from the cold? 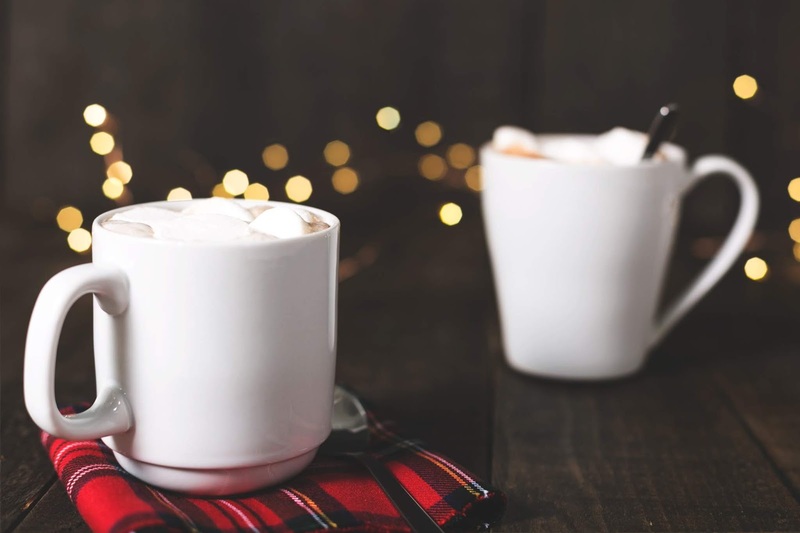 Whether you've been shoveling the drive, leading a snowball fight, or just coming in from a long day of work, these five yummy drinks will have you toasty warm and smiling in no time! London Fog - I found this recipe over on The Healthy Maven, and instantly fell in love! Earl Grey tea has been a favorite of mine since childhood tea parties with my Nanny Balkum. The London Fog takes this classic and kicks it up a notch with subtle sweetness and frothy milk. Don't you love when something you enjoy gets even better? Irish Coffee - There are a lot of flavor combinations I enjoy, boozy coffee is high up on this list. When I'm in the mood for a warm, adult beverage, Irish coffee is my favorite. This recipe from Diethood is magic in a cup! Peanut Butter Hot Chocolate - Another amazing combination of flavors is peanut butter and chocolate. This hot chocolate reminds me of peanut butter cups. If you are a fan of creamy, peanut buttery goodness coupled with decadent chocolate, this drink recipe from The Happier Homemaker is sure to hit the spot. Pink Hot Chocolate - If you are looking for something a little different, this tasty treat from Homemade Ginger is something you should check out. Not only is the drink pretty and tasty, the mix for it would make adorable Valentine's Day gifts for the hot chocolate lover in your life. Hot Butterbeer - Bring a taste of Hogsmeade home with this rich butterbeer recipe from Mom's Have More Fun. I've tried several butterbeer recipes in the past, none of them hit the spot quite like this one does. Why not whip up a big batch and have an HP movie night? Let me know if you try any of these recipes and what you think. What are your family's favorite winter beverages?